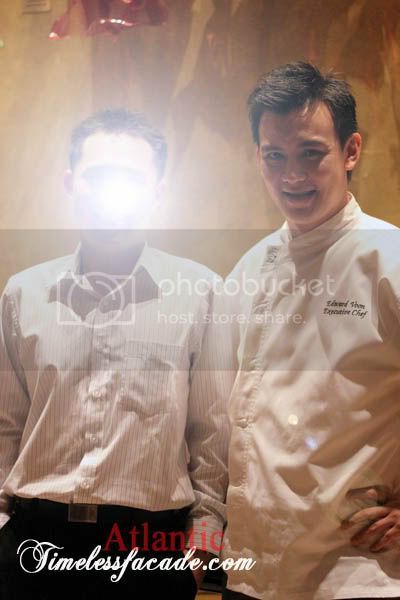 I've always been a fan of Chef Edward Voon, ever since his days at Dolce Vita. 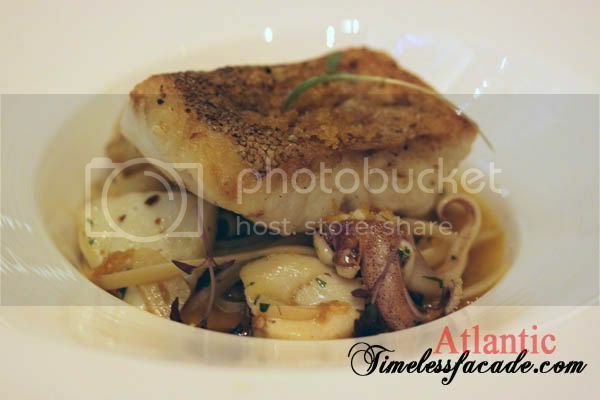 Hence it was no surprise that I jumped at the chance to dine at Atlantic Dining Room, where he joined barely 3 months ago from the now defunct Aurum as Executive Chef. 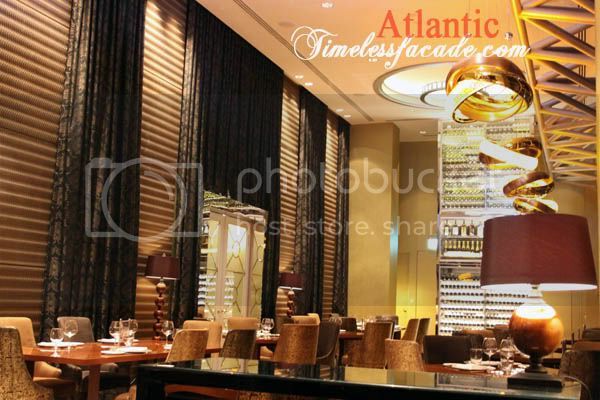 Chances like this are few and far, especially when the place where Atlantic Dining Room is located, Tower Club, is exclusively for members and their guests only. And to up the exclusivity factor, membership is by invitation only. 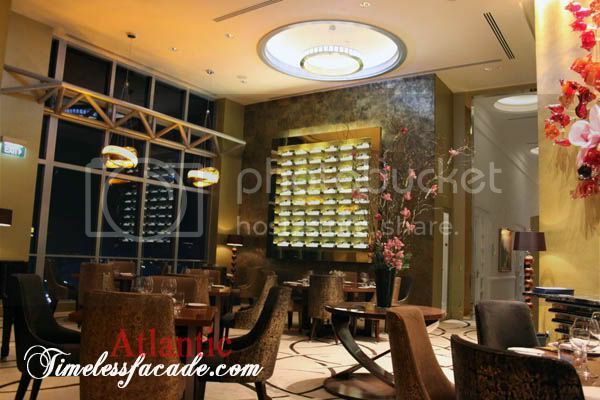 Perched right at the top of Republic Plaza on the 62nd - 64th story penthouse, Atlantic Dining Room boasts high ceilings coupled with a posh and luxe interior with elaborate finishing and plush chairs. One thing to take note of here, all cellular phones must be put to silent mode and there is a very strict smart casual dress code. 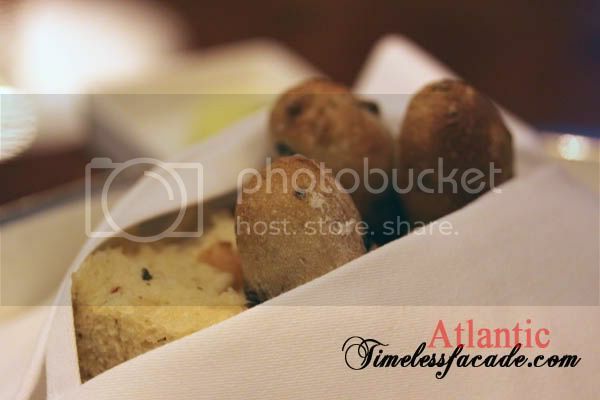 There were 2 varieties of bread, french loaf with olives and focaccia. I didn't think too much of the french loaf but the focaccia was great. Soft with pockets of herbs and sundried tomatoes permeating through, resulting in a tasty and comforting slice of bread. And the best part was, it wasn't oily. The olive oil butter deserves a writeup all by itself, solely based on its uniqueness. The butter looked exactly like normal butter and sported a similar texture. 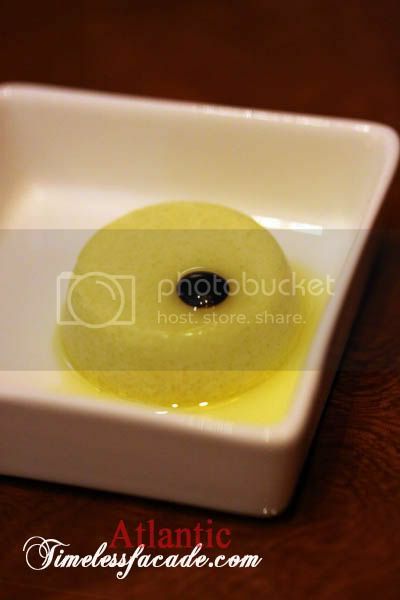 However, it was made from olive oil, so imagine a butter with an olive oil taste. Very interesting! The butter was also a prelude to the other fascinating items to come in the menu. The interesting part about this dish was the black wrap covering the salad, which was a little gelatin like but bears no resemblance to anything that I know. 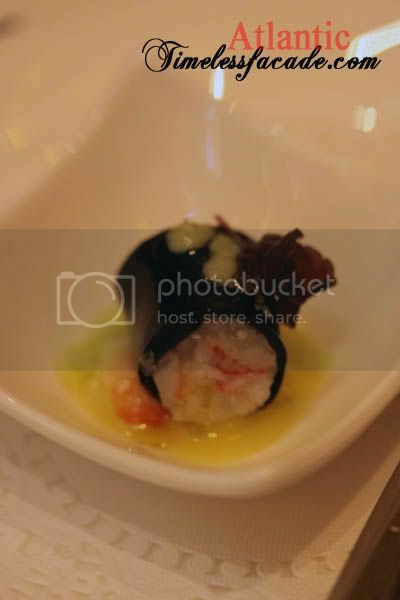 The salad itself had lots of onions which gave it a nice crunch while the crab came across as light and savoury with the wasabi significantly mild. This dish injected a little humour into our dinner. 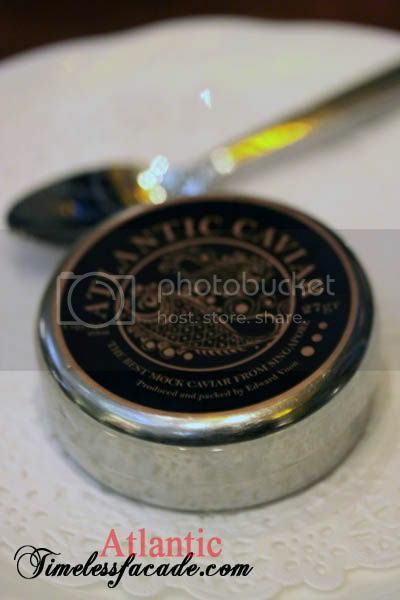 The cover wrote "Best Mock Caviar from Singapore. Produced and packed by Edward Voon." 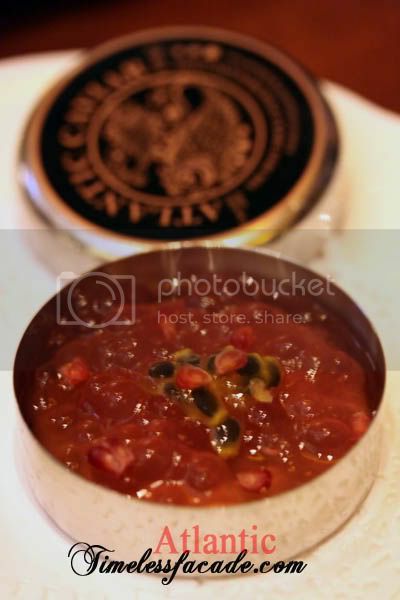 What was actually in the metal container was a jelly like substance that looked like salmon roe with a passion fruit and strawberry centre. There was a tinge of alcohol in the background as well. The trout looked really raw on the outside but slicing through it proved a piece of cake. The meat was smooth, firm and fresh without coming across as raw. 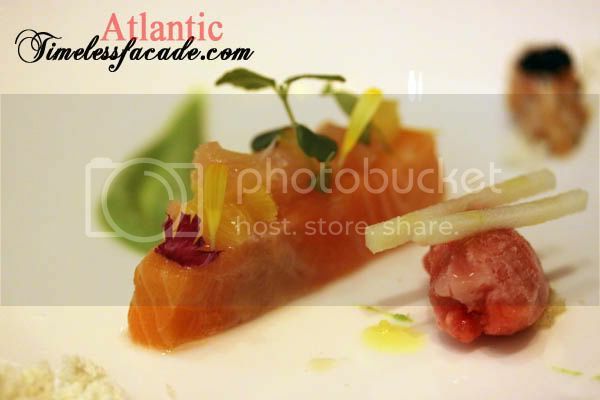 A dollop of orange bits were placed on top to counter and fishiness that the trout might have. The fruit sorbet was sweet and had bits of unidentified crispy stuff below while the olive oil powder amazed me with its texture. A really interesting play of flavours! This has got to be one of the best scallops I've eaten in the past year or so. Well seared with a nice smooth texture sans the fishiness. The laksa sauce was frothy, almost like foam and the spiciness kicked only kicked in a few seconds after consumption. The highlight of this dish was probably the olive oil, which was injected from a syringe into the Shitake sauce. Lo and behold, it turned into a strand of noodle that was similar to ramen with an olive oil taste to boot! The prawn was huge and sweet but I thought that the batter could have been a little thinner. 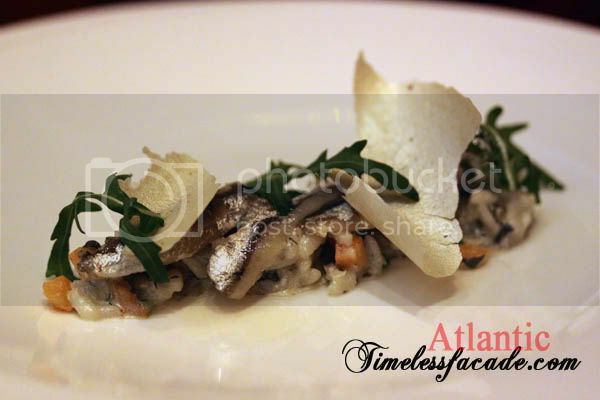 What was intriguing about this was the polenta (boiled maize), which came in thin silvery sheets atop the sardine, which incidentally, was a little too soft for my liking. I did like the risotto though - al dente and not too creamy with carrots providing an additional crunch. 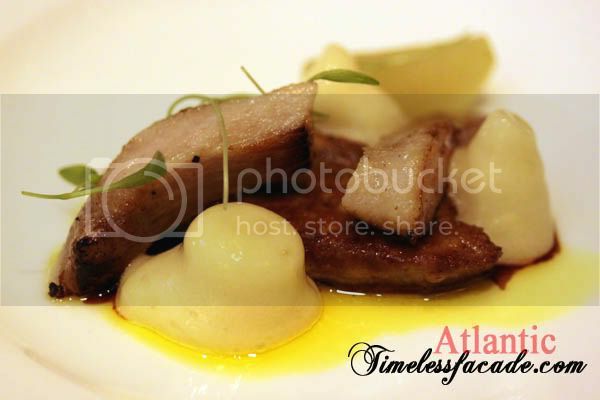 The foie gras was pan seared till crisp on the outside. It certainly wasn't quivery nor near the best I've tried but I must say that it went very well with the apple foam. The pork cheeks were melt in the mouth tender and definitely a nice addition to this already sinfully rich dish. 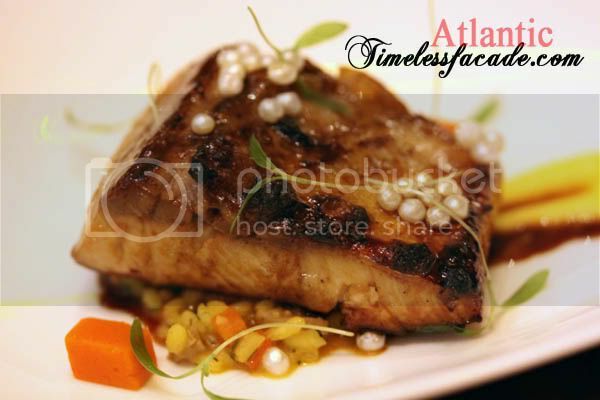 Another amazing dish, the fish (not too sure what fish is it) had a firm texture to go along with the nice BBQ taste. Topped with little silvery pearls that were in fact smoked water, I was rendered speechless. You might question how do you smoke water? In all honesty, I have no absolutely no clue. According to Chef Edward, the water is smoked and then solidified to form the pearls. 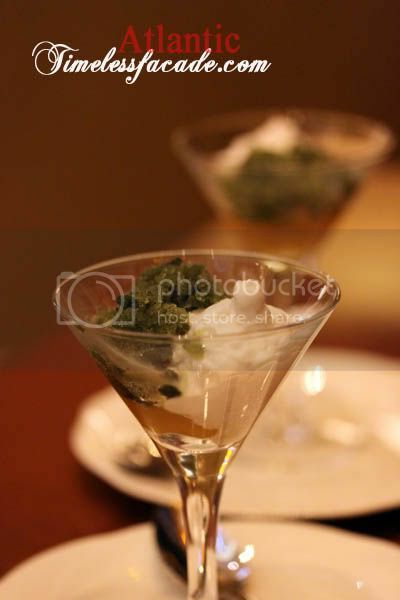 Interestingly, the pearls had a slightly chewy texture with a strong smokey aftertaste. 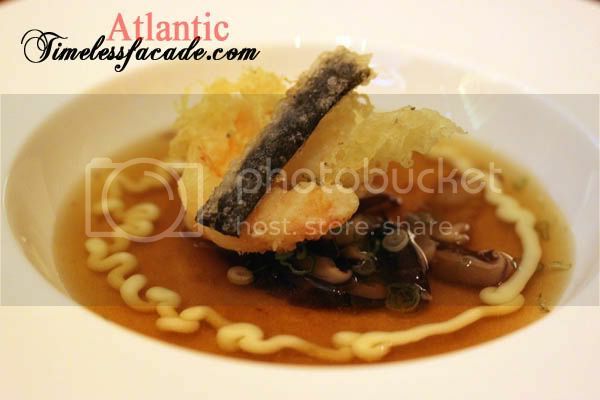 I only tried a little of this dish but the fish did seem very well seasoned and flavourful. A pity the pasta didn't seem home made and came across as overly salty. 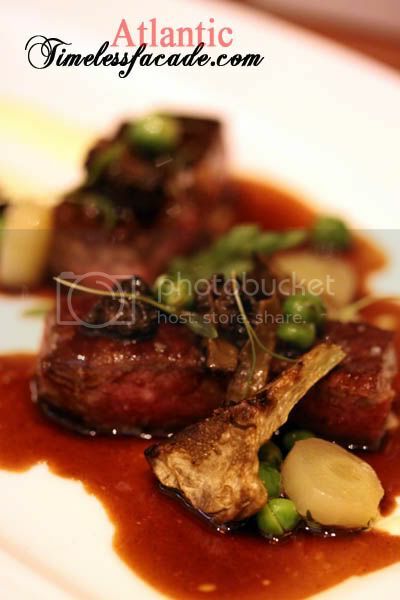 No surprises here, just good old fashioned tender wagyu beef that was well marinated and done up medium rare. I did find it a little too salty though. I'm not a fan of sour stuff so this dessert didn't do it for me. But the coconut cream was nice and light. 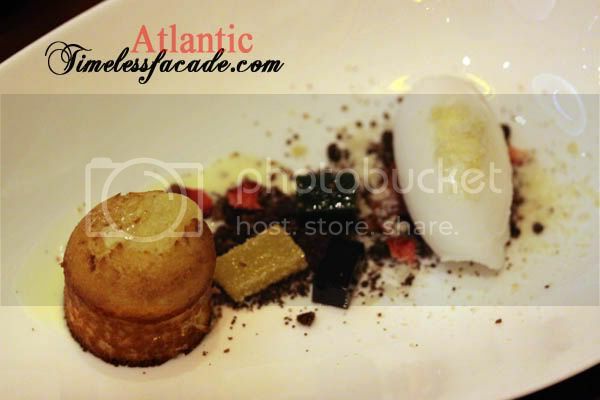 Catchy names aside, this dessert was yet another amazing dish. The first chocolate referred to the white chocolate cake while the second chocolate referred to the coarsely grounded bits of chocolate that reminded me of soil. Here's the marvelous part. The white chocolate cake had a moist center with a hint of egg and almond and ever so heart warming. To infuse some excitement, the grounded chocolate was done up to crackle incessantly when placed into your mouth, very much like the fizz pop candy for kids of yesteryear. Very nostalgic! I've lost count of the number of times I've used the word amazing in this single blog post alone. The dishes are truly progressive and I'm pretty sure my photos and descriptions do it scant justice. The dollars and cents portion ($400 for 2 pax) is a little on the steep side but I feel that its money well thought and well spent. And I'll certainly be back, especially with one of my favourite chefs at the helm. See the glow on my face? Celestial Bright Glow after the $400 meal but of course. 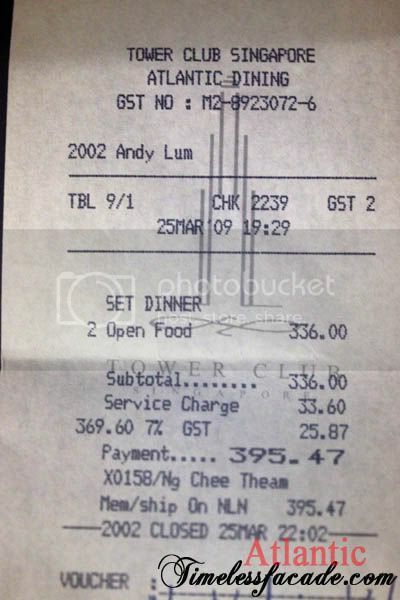 bimbo: I don't think anyone will turn up for a $200/pax dinner lol..
Ee ling: How to tar pow? lol..
ahhhh, this must the place that u raved about on FB. gosh, if u said it's good, it shd be really really good stuff! hope to check it out soon! 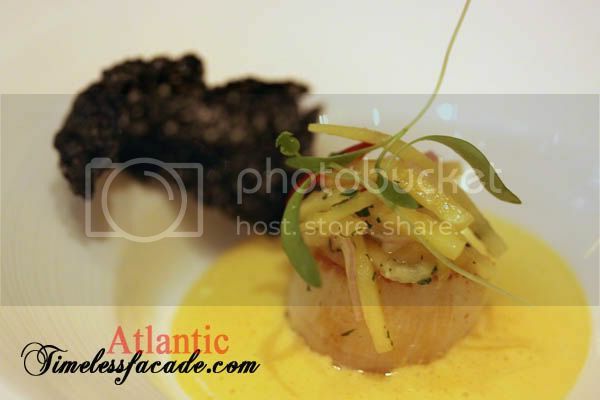 the scallops, that just looks gorgeous.. one heck of an expensive dinner but looks worth it! .. and that glow on your face.. was that on purpose?! this is certainly the greatest highlight in your blog. too bad for the 'invite only'. i'm sure u are not going to miss this chance, are u?